The home run feature is still yet-to-be-ignited, but Gaby Sanchez did ignite the ballpark in the eleventh inning, during the eleventh hour, of Friday the 13th. Miami held the lead over the Astros for the whole game until the eighth inning when J.D. 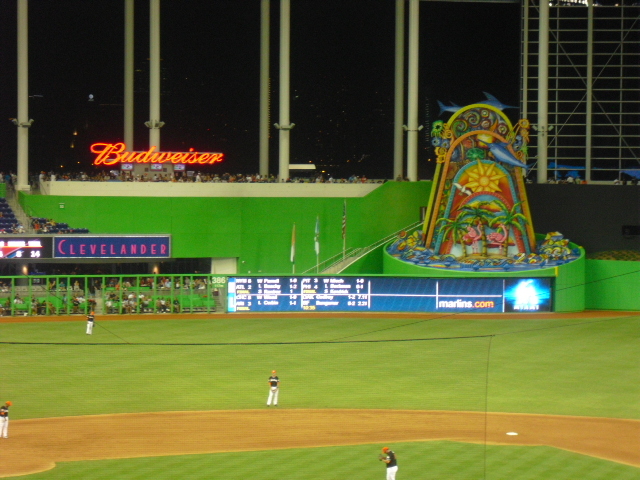 Martinez hit the first (official) home run at Marlins Park, a two-run shot to tie the game at 4. In the top of the ninth, Heath Bell recorded two quick outs, but made everybody uneasy when he hurled off 14 consecutive balls to load the bases and go 2-0 to Carlos Lee. Lee fortunately grounded out to Gaby Sanchez to end the threat. Omar Infante, the hottest hitter on the team, flew out to deep left-center to end the tenth-inning. The inordinately deep ballpark has swallowed up a number of Marlins’ fly balls in these first two home games that would have been round-trippers at Sun Life, or any average Major League park for that matter. Chris Coghlan singled to lead off the eleventh, and finally Gaby Sanchez came through with a shot to left, which hit off the chain-link fence in front of the Clevelander, and caromed back toward the field. The powerful bounce off the wall gave Coghlan enough time to scoot around third and slide across the plate without a contest. And the Marlins have recorded their first win, and first walk-off, at the new park! Next Light That Thing Up!! !